After much patience on Paula’s part, she was “called home” on September 16, 2018. 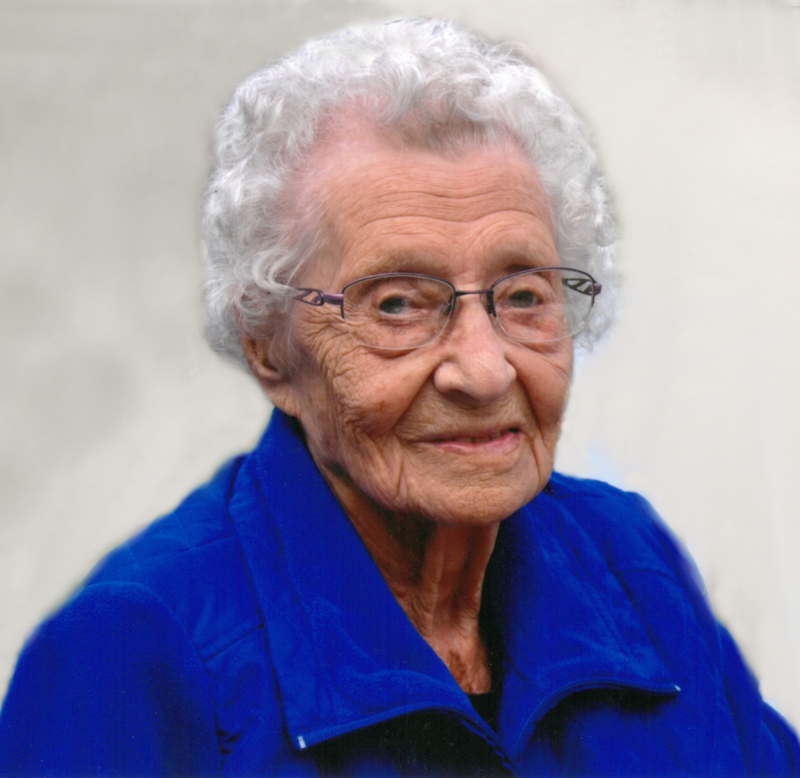 Paula passed away peacefully at the Rosthern Mennonite Nursing Home. She was an amazing 105 years old. Paula is survived by her daughter Dorothea (De) Honn, grandchildren Monica (Temuri) Goletiani and Conrad Honn, great grandchildren Emma Honn, Margaret, Claudia, Christian and Matthew Goletiani, daughter Velma (Eric) Harder, grandchildren John (Sandy) Koop Harder, Kip Harder (Heather Burkowski) and great grandchildren Nicholas and Andreas Koop Harder, Nadia and Jaden Burkowski, wonderful friend Mavis Nystrom, siblings Victor (Sarah) Regier, Don (Mary) Regier, Verna (Abe) Klassen, Wilma (C.J.) Dyck and numerous nieces and nephews. She was predeceased by her husband John R Dyck, parents Cornelius and Johanna Regier, siblings Agnes, Peter, Frieda, Johanna, Irma, Irwin, Edith, Walter, Harold, Anna, Bernice, John, their spouses and several nieces and nephews. Paula was born on February 6, 1913 in Laird Saskatchewan to parents Cornelius W. Regier and Johanna Funk Regier. She was one of 17 siblings. Paula was baptized on May 15, 1932 in Tiefengrund Mennonite Church. Paula’s faith remained an important aspect of her life and was attending Rosthern Mennonite Church. It was through church that Paula met her husband, John R. Dyck (b. July 19,1913, d.1988). They were married Oct 11, 1941. Paula and John had many adventures together: farming, raising children and a number of terms with Mennonite Central Committee which took them to Paraguay, Korea, Jordan and India and time spent living in Winnipeg while John helped create Mennonite Foundation and the Food Grains Bank. Paula’s priorities lay in her faith, family and the simple pleasure in life such as music and reading. Paula lived out her faith as seen in her active church membership ( even attending church meetings in her early 100s), involvement in MCC and being a strong supporter of church based education. Paula also spent much time sewing for the Rosthern Clothes Basket. Paula’s family was scattered across North America and Paula loved to visit and play. It was not uncommon to find Paula on the floor playing or sliding down the stairs with her great grandchildren into her mid to late 90s. The great grandchildren lovingly referred to her as G.G. – great grandma. Music was a constant theme in her life and remained so until she died. Paula was an accomplished pianist who studied music and taught piano in her younger years. She continued to play piano into her 100s. Paula’s love of music inspired her to spontaneously burst into song much to the joy of those around her. Paula’s love of reading was something she developed later in life. Into her 100s, it was not uncommon for her to read +6 hours a day everything from the Rejoice devotional to Kafka. Paula was an inspiration to many. Please join us on November 3rd, 2018 at 2:00 pm at Rosthern Mennonite Church to celebrate her life. We would also invite family and friends to an evening of visiting and storytelling on Friday November 2, 7:00pm at Good Neighbours Food Centre, 1000 6th Street, Rosthern. A private interment will be held prior to the memorial service. The family wishes to extend a sincere thank you and appreciation to the Pineview and Rosthern Nursing Home staff for the loving care you gave our Mother. She called you her angels and you responded in kind. In lieu of flowers, memorial donations may be made to Mennonite Central Committee, 600-45th Street West, Saskatoon, SK S7L 5W9; Rosthern Junior College, Box 5020, Rosthern, SK S0K 3R0 or a charity of your choice. Arrangements are entrusted to Funk’s Funeral Home, Rosthern, SK (306-232-5245, http://www.funksfuneralhome.ca).